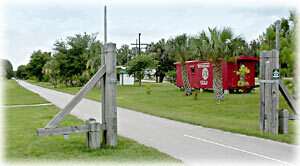 Winding its way from Citrus Springs in Citrus County, southward to the trailhead at Trilby, south of Brooksville. 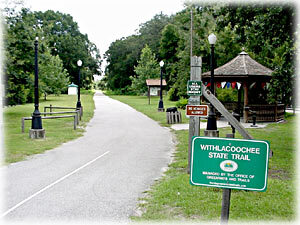 The Withlacoochee State Trail is a 46 mile paved trail that passes through a variety of landscapes and environments. It also runs through a number of communities that offer refreshment and interesting visitor attractions. 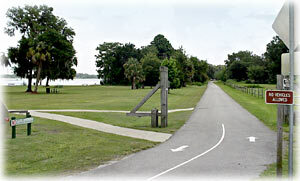 The Withlacoochee River Canoe Trail and Fort Cooper State Park in Inverness are just two of the recreational opportunities one will encounter along the trail. The Withlacoochee State Park is a beautiful haven for the area's wildlife and natural vegetation. Visitors can explore the reserve, but be careful not to disturb this magnificent environment. 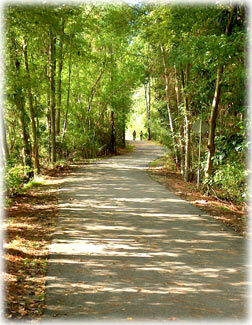 The trail is perfect for hiking, cycling, running, and rollerblading. There are plenty of stops along the trail for rest and refreshment. Restrooms are also conveniently spaced along it. Running parallel to the trail in sporadic portions is an unpaved equestrian trail. Enjoy a wonderful afternoon of riding, taking in the incredible natural surroundings, glimpsing a variety of wildlife, from birds to squirrels, to the occasional deer. 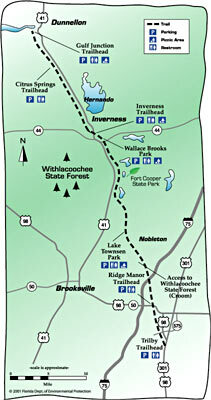 The trail is a Citizen Support Organization and is part of the Rails to Trails of the Withlacoochee. The group has developed a fully detailed guide describing the trail and features along it.